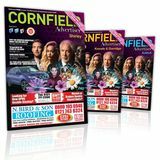 Hello and welcome to your September edition of the Cornfield Magazine. Our September issue has got you covered for exciting ideas on how to make the most of your month… from romantic weekends away to planning your next family adventure. This month we took a fantastic trip to Warwick Castle and checked out the medieval myths, beautiful interiors and family-friendly activities. It’s been a very sporty few weeks and we’ve embraced our competitive streaks whilst playing golf at Copt Heath Golf Club and attending the must-see golf event at Nailcote Hall! Explore our fabulous wedding feature offering advice on how to tackle prewedding stress, manage your budget and find the perfect location for your big day. Find inspiration for everything from colour schemes to choosing the right dress and tie the knot in style. We’ve even got catering covered! Why not take a look at our top City Breaks and book your next getaway today? We’ve carefully selected some of the best locations for a relaxing long-weekend escape to shake up your September. If that’s not enough, we also take an exclusive look at the new release, Kingsman: The Golden Circle and delve into the critically acclaimed Netflix sensation Narcos to give you the ultimate viewing experience. We are fortunate in this country that, thanks to organisations like The National Trust and English Heritage, many historic houses are open to the public. Whether you view them as testaments to the style and good taste of their mainly aristocratic owners or as monuments to a class system, the legacy of which still overshadows present day society, the fact remains that they are an indisputable part of our heritage. Many houses were designed and furnished to manifest wealth and power but Baddesley Clinton is somewhat different, in that even today it has the aura and proportions of a comfortable gentleman’s home. It is an historic house in which one can actually imagine people living everyday lives, rather than perpetually making a social statement. The great hall with its impressive stained glass was constructed in the 1570s and is dominated by a stone chimneypiece, which was originally located elsewhere in the house. From here one can visit all the other rooms such as the drawing room, the chapel, library, and Henry Ferrers’ bedroom. The visitor cannot fail to be impressed by the decoration, panelling and furnishings of the interior. The house is accountably an almost perfect example of a moated manor, of which there is not a great number in this country. The moat was dug in the 13th century and the first house dates from the 14th century, although much of what one sees today dates from the early 16th century. For five centuries it was the home of twelve generations of the Ferrers family, who maintained their loyalty to the Catholic faith, in the dangerous times of the late sixteenth and early seventeenth centuries. Giving refuge to Catholic priests was an act of treason and, even in our secular age, one cannot but admire the courage and religious conviction the family displayed. When Baddesley Clinton was given over to the National Trust in 1980 the estate covered much the same area as at the end of the 17th century. Some of the most interesting features of the house are the three priest's holes, hidden chambers, which protected Jesuit priests from the ‘priest hunters’. Arrest for a priest meant imprisonment, and often torture and execution, which was the fate of Saint Nicholas Owen, allegedly the builder of the hiding places. There were also very severe penalties for those sheltering a priest. The Building The frontage is an architectural gem with its combination of bridge, moat and crenelated gatehouse, plus stonework and windows of different periods. The courtyard is a 19th century creation, featuring brick paths and a central lawn planted with the coat of arms of the Ferrers family. It may seem as if it is too early to begin planning the works Christmas party, but in actual fact December will creep upon us rather quickly and venues, restaurants and attractions will be booked up well in advance. So, if you are in charge of the organising and are struggling for ideas, then we have put together a selection of quirky and diverse ideas to make your workâ&#x20AC;&#x2122;s Christmas party one to remember. As we wave goodbye to the warmer weather and get ready to switch to our autumn wardrobe, what better way to tackle the end of summer than to arrange an exciting weekend away? A short city escape to break up your working week and free you from daily stress is the perfect way to avoid post-summer blues. Edinburgh When imagining your next holiday getaway, it’s probably seldom that you picture Scotland. But the capital city is the perfect location for an extraordinary break. Without a doubt the Edinburgh offers a little something for everyone. An unforgettable day out… Step back in time and visit the breathtaking castle for a day of historical discovery and adventure. Book online to tour the grand ceremonial rooms, with children under 5 going free! After a morning of exploration, try trendy George St for luxury shops and charming independent cafés. For the Adults… Why not spend an evening discovering the lowland’s distinctive produce and quench your thirst with Scotland’s national drink? Edinburgh is renowned for its brilliant whisky distilleries. For a more intimate experience, try The Bow Bar - with a capacity of 88 it’s often standing room only. Awarded Best Whisky Bar in the UK (twice! ), this no-fuss establishment is the proud home to over 310 single malts. For the Family… Go outdoors to the Royal Botanic Gardens or pop over to Edinburgh Zoo and take part in a wide range of family-orientated activities. The Camera Obscura and World of Illusions make learning fun, X-Rays, giant Kaleidoscopes and hypnotising holograms will captivate children’s imaginations and create a truly unforgettable interactive experience! Vienna This beautiful city can be reached in just over 2 hours from Birmingham Airport; with several airlines providing discounted long-weekend deals! Whether you’re looking for family-friendly fun or a romantic escape, Vienna is the perfect place to be. For a day trip visit the Belvedere Palace with fantastic exhibitions and jawdropping gardens, or head over to the Museum Quarter for a cultural afternoon in Vienna’s Museum of Modern Art. To avoid busy tourist spots try locals’ favourites like the cosy Café-Bar Lukas or scrumptious Puerstner restaurant, specialising in delicious Austrian cuisine. In the evenings kick back in the city’s hidden bars, tucked away next to the Danube River and enjoy popular Hugo-Spritzers, whilst the rest of the city sleeps. Are you looking for a delicious dessert for family and friends this summer, but want to keep it simple and easy? This no bake peach yum yum recipe is your answer to a tasty and fruity dessert for all to enjoy with its creamy layers and peach pie filling. This is sure to be a hit with guests! Method 1. PREPARE CRUST: In a bowl, combine the crumbs, cinnamon, and ground cloves. Add melted butter and blend with a fork until crumbs are moistened. Set aside 2 tbsps. of crumbs to sprinkle on the top. 2. Press crumb mixture into the bottom of a 9x9-inch pan (sprayed with non stick cooking spray) 3. PREPARE FILLING: With an electric mixer, cream together softened cream cheese and 6oz of sugar until smooth. In a separate bowl, whip the cream, 3 tbsps of sugar, and vanilla extract until peaks form. By hand, mix the whipped cream and cream cheese mixture until well combined. 4. ASSEMBLE YUM YUM LAYERS: Spread a little less than half the whipped cream/cream cheese mixture evenly over the crust. Evenly spread peach pie filling over the whipped cream layer. Top the pie filling with the remaining whipped cream/cream cheese mixture. Sprinkle with the reserved graham cracker crumbs. 5. Refrigerate overnight. Planning your wedding can be a little overwhelming when it comes to keeping track of everything you need to organise. From caterers, open days, entertainment and designing the invitations, you need not panic and from the experience of currently planning my own wedding, I can highly recommend purchasing a wedding planner, which sets out dedicated pages for each and every part of your wedding. My wedding planner is designed by the brand, ‘BusyB’ who have thought of every last detail. Planning your wedding can seem like a full time job in itself, which can be extremely draining when you already work full time. Choosing your dream venue is undoubtedly, one of the most difficult choices you will make, so consider your options early on. Your desired venue will determine the amount of guests you can invite and styling too. If you’re anything like me, it may be that you want a low-key and intimate wedding surrounded by family and close friends. You should then begin your guest list, which will determine those numbers. Booking your venue 12 to 18 months in advance is advised but if time is of the essence, have no fear, there are plenty of last minute bargains to be had. For a glamorous wedding you may want to look into boutique hotels, or if you have always dreamed of marrying your Mr. Darcy, then a country manor may be the way forward. If you want a combination of everything, then a tipi or marquee can cater to all your wedding needs. Finally, when selecting your venue, be savvy, careful and keep in mind how far your guests may need to travel. A wedding can be a huge expense with the average wedding costing £27,000 in the UK, unless you are strict with your budget. It all costs, which is why setting yourself a budget is a great way to keep track of your expenses. Set The Date Selecting your wedding date is one of the most important decisions that you will have to make, as this can impact everything from availability with suppliers, through to what you will wear, whether your wedding will be indoors, outdoors or abroad. Plus, in peak season, booking costs can change dramatically. Securing your date and venue at least 12 months before your wedding is crucial to avoid disappointment. Open Days & Events There are a great selection of wedding fayres and open days in the West Midlands, Warwickshire and Worcestershire. It is always an excellent idea to attend these types of events in order to gain a whole host of information, special offers and supplier potential. Some of the best shows to attend: include The Midland Wedding Show, which will be held on Sunday 10th September at the National Motorcycle Museum in Birmingham and The National Wedding Show held at the NEC in Birmingham on Friday 29th September to Sunday 1st October. Colour Schemes Picking your wedding colour palette isn’t as simple as it sounds. The best way to choose a colour scheme is by collating some ideas from your wedding setting. A simple entrance rug or a statement piece of furniture can spark a range of colour influences. Why not consider creating a mood board of things you come across from magazines, fabrics and website findings. Or alternatively, if you do not have enough time to get creative, why not save a pinterest board of all of your favourite discoveries. Focus on the season with pinks and pastels, which work well with spring, whereas brighter corals are a staple colour during the summer. Silvers, ivories and reds are fantastic choices for winter. The Dress This is a major focus for the bride. From previously managing a bridal boutique I have picked up on so many do’s and don’ts of sourcing the perfect gown. I have seen so many families argue over what the bride should wear. I cannot emphasize it enough, but you are going to be the one wearing the dress and not everyone will like the same thing. So, go with your instinct and follow your heart. You will know when you find the dress of your dreams. But, also don’t be afraid to try on something you would never have envisioned yourself wearing. You may be pleasantly surprised. I would suggest that you only take two people to a dress fitting. Plus, you will want your dress to be a surprise to the rest of your bridal party. Again, leave 10-12 months when ordering your dress, to allow the designer and seamstress time for last minute alterations. The Groomâ&#x20AC;&#x2122;s Attire For the Groom, picking out a wedding suit or tux can be a fun experience. There are a few things to bear in mind when it comes to choosing formal wear. The first rule is never to overshadow your bride. You should complement each other. The second rule is to make sure you outshine your groomsmen. Also, know your wedding, a black tux is smart for the night time, tweed may be appealing for a winter wedding in the countryside, whilst a light grey suit may be the perfect choice for summer. If money is an issue then why not look at hiring a suit for the big day. Also, be mindful when choosing trendy over timeless; a classic look cannot be faulted. Most importantly you should research your tailor and go easy on the accessories. Remove wrist watches, bracelets and chains, although a pocket watch can add a touch of class. Keep cufflinks simple and invest in those shoes. Wedding Stationery Making sure you donâ&#x20AC;&#x2122;t miss a thing is crucial when it comes to wedding stationery. If you have always wanted to display your artistic ability, design your own, portraying your personalities. This can be a therapeutic and satisfying activity. Eco friendly stationery has become popular, which allows you to use recycled paper. Or you could go that step further and create your own website, which reduces printing costs and paper usage. There are many craft websites to gain inspiration from and stores such as Hobbycraft that have a great selection of wedding crafts. station. If you still want a meal, but want to avoid the norm, you can try Spanish paella, cooked in sizzling pans. This also makes for great entertainment Alternatively, you could try a hog roast, burritos, wood fired pizzas, a gelato van for dessert, or a vintage sweet station for those with a sweet tooth. Photography & Videography The photos are the key to holding those memories and are a great way to look back and recall your special day. Dependent on budget, finding a great photographer can be difficult, so do your research. Plan to meet with your photographer and show them your ideas, ask questions, create a list of styles you like and most importantly in engaging your photographer or videographer, make sure you are comfortable working with them. This is often why many couples trial an engagement shoot with their chosen photographer, which helps you both to gain confidence in front of the camera. Our Wandering Pizza oven makes fresh woodfired sourdough pizzas wherever it is needed! associated with love and passion. The bridal bouquet is the ultimate accessory for the bride with the rule of thumb being that the bigger the dress the bigger the bouquet. If real flowers are not for you, then opt for silk flowers or specially made vintage paper designs, which you can cherish forever. Hair, Beauty & Make-up Finding the right hairstyle for your wedding day can be tricky but stylists will be able to make your hair ambitions come to life. Creating a pinterest board of inspiration for your stylist will give them a real insight into what you are after. Having a hair trial for your bridesmaids and yourself will put your mind at ease and the stylist can learn how to work with the different hair types. One lesson I have learnt when it comes to make-up is to have a couple of trials and communicate your concerns with your chosen make-up artist. You will also want to look like a natural beauty on your wedding day. If you are a make-up expert then there is no harm in doing your own make-up. This will save you lots of money and give you plenty of time to practise. Entertainment Inspiration Entertainment can be costly, but it goes down a treat with guests, whether it is an acoustic guitarist for background music. A caricaturist leaves guests able to take away a little amusement, whilst a magician leaves guests wowed. Alternatively, to keep guests entertained, you can choose from a selection of outdoor games, such as giant jenga, or a host of traditional games, perfect for the children. Why not organise a fun quiz for the bride and groom or even for the guests and you can leave this task to the best man and bridesmaids. months; maybe it is because it is such a busy time for us in the salon. It could be that you’ve survived the summer and are looking forward to the children going back to school! Whatever it is, this is the perfect time to think about ‘You’ for a minute, and don’t you dare feel guilty! There are many ways to relax, and finding one that works for you is the first step. It may be gardening or reading a book, having a soak in the bath with aromatherapy oils or going down a treatment route; which I will be looking at today. With such a variety of treatments available, designed to help our health and wellbeing, I wanted to highlight a couple of options and their benefits. Massage With so many therapeutic benefits to both the body and mind, this is often the first treatment people think of when they want to relax. However, if you choose the wrong type of massage then the experience could leave you feeling more stressed than when you arrived. Aromatherapy massage is a wonderful way to relax as, not only do you benefit from the physical actions of the massage such as soothing muscular tension and improved circulation, it is the restorative properties of the oils themselves that have immense benefits. An aromatherapy massage can be deeply relaxing or more uplifting depending on the oils and the massage techniques used by the therapist and all of this should be discussed during your consultation. The oils you choose can help with disturbed sleep, digestion issues, hormonal imbalance or a lack of energy. If you haven’t experienced massage before then this would be the perfect introduction in my opinion. its balance naturally. Usually after a treatment, your tension may be reduced and you might feel relaxed. You might also notice yourself sleeping better and find your mood and sense of wellbeing improving. You may also find that other aspects improve too; however, this happens on an individual basis. With ever increasing levels of stress in everyday life, it is important for people to take more responsibility for their own healthcare needs. Reflexology may be one of the ways to mitigate the stresses of modern life. As amazing as the above treatments are, there are some things you can try which won’t cost you a penny: Laugh – it really is the best medicine. Laughter releases endorphins that improve your mood whilst decreasing levels of the stress causing hormones; it tricks your nervous system into making you happy. However, a spontaneous burst of laughter at your desk could raise a few eyebrows so pick your moments carefully… Sleep - probably the most effective stress buster there is. Although stress can cause you to lose sleep, lack of sleep is a key cause of stress. A vicious cycle which causes the brain and the body to become out of balance. Try to get the recommended 6-8hrs per night. Turn off the TV, don’t look at your smart-phone and do your best to get into bed and relax. With over 20 years’ experience as a beauty therapist, Kelly Shaw's passion and dedication to the industry has enabled her to achieve professional success as Spa Director for some of the world's most exclusive global resorts. Founder of Kelly Shaw Consultancy Ltd and Hampshire's multi award-winning boutique salon k:SPA, Kelly also sits on the board for both CIBTAC and BABTAC - British Association of Beauty Therapy & Cosmetology. September, the month where life seems to get busier again. With the kids back to school, it takes longer getting into work and the days are feeling that little bit shorter and time just seems that little bit more fought for. Whether planned or unplanned, we all have those mornings when we are scrambling around to get ready for the day. Unfortunately there is no magic wand we can wave to suddenly look flawless at the drop of a hat, but there are some quick tips you can follow to help save some of that precious time. A sleek face palette containing 3 shades to perfect brows, one blusher, bronzer and highlighter, and 9 on-trend eyeshadows. It may sound obvious but prepping for the following morning will undoubtedly save time while you're standing there like a zombie, have the kids asking a million and one questions and lunchboxes to make etc. Having your make-up organised so you can save time stumbling around trying to find that ever so important mascara! Too Faced This sweet array of eyeshadows, blushers and gorgeous bronzer. This is compact for the smallest of bags and great for ‘on the go’. Benefit, her name is Glowla. This palette includes everything you need in perfect delicate shades that complement any skin tone. Smashbox Masterclass For the truly beauty obsessed, this palette brings you some of the best smashbox has to offer. With a multitude of shadow, lip and cheek options, you can always put your best face forward. Dior colour designer all in one palette I adore this Dior palette, It has everything you need on the go. Powder, sleek eyeshadows, gorgeous lip colours, blusher, bronzer and mascara! a role in somatic symptom disorder, which is characterized by physical symptoms such as pain, nausea, weakness, or dizziness that have no apparent physical cause. 1. Poor mental health is a risk factor for chronic physical conditions. There is no shame in suffering with a mental health problem. It may be short term, as associated with a bereavement, other loss, divorce or financial problem OR it can be a long-term diagnosed illness such as Bi-Polar, schizophrenia, paranoia or clinical depression. What is important, is to identify it, accept it, treat it and manage the symptoms. Supporting someone through a mental illness can be challenging and exhausting, however, the person suffering, is really going through a very traumatic and frightening time. No matter how uncomfortable it is for you, watching the person with the condition and the condition presenting itself compares minutely to the feelings and fear they will be experiencing. Learn how to identify the signs and signals so you can support someone who is suffering. Mental health problems are disturbances in the way in which people think, feel and behave. Terms include mental disorder, mental breakdown, burnout, mental illness, mental ill health, nervous breakdown, stress, work related pressure and psychiatric illness. The UK’s chief medical officer, Dame Sally Davies, has estimated that about 70 million working days are lost every year as a result of stress and mental ill-health, costing the nation between £70bn and £100bn. A further £2.4 billion is lost replacing staff who leave work because of mental ill-health. The cost of “presenteeism” – where people come to work unwell and are unproductive as a result – could be higher still. And, even though it affects so many of us, mental illness remains a taboo subject. According to a poll of workers by mental health charity Mind, of the 20 per cent of respondents who had taken sick leave in the preceding year owing to stress, only one in 10 had told their employer the true reason for their absence. Employees are often reluctant to come forward and discuss mental issues with their employers, and by the same token, evidence suggests many employers underestimate the extent of the problem among employees each year. The important thing is not to think you are immune to experiencing any form of mental health issue. As we think, breath, eat and drink we are also programmed to "mal-function" in times of stress, worry and anxiety. Identifying this change in our Mental Health is the key to managing it and understanding what makes us tick. Sadly, the suicide rate amongst men has rocketed in the last couple of years, in the UK and Ireland. Every day in the UK, 14 men take their own life. The statistics are higher in the Republic of Ireland. There is no age distinction or trend and there are often no warning signs. Everyone, without exception will go through either stress, anxiety or depression at some point, if not ALL of them throughout their life. The difference is the severity at which we all suffer them. So, even an "off day", not wanting to get out of bed, feeling worthless, loss of appetite or just being fed up, is a form of mental health and we all go through these episodes. Low Back Pain NHS England reports back pain to be “the largest single cause of disability in the UK”, so knowing what to do if you are experiencing back pain is really important. So what should you do? Most Low Back Pain is what we call Mechanical Low Back Pain, which means it stems from the muscles, joints and soft tissue around the spine. It is often centred in the lower back and doesn’t go into the legs. Mechanical Low Back Pain usually settles down within a few weeks or so and resting for more than a few days can actually make the situation worse. As you rest the muscles around your spine can start to get weaker and the joints in the spine a bit stiffer. This can make movement more difficult and in turn have an adverse effect on the pain. Research has shown that for the majority of cases the best way to manage mechanical Low Back Pain is through exercise. Doing gentle exercises, as far as you are able, and gradually building up. It is fine to continue with your normal activities but do so within your limits of pain and build back up to your regular exercise levels. Some people may find heat helpful to reduce muscle spasm and ease pain. For example, a heat pack that is warm, not too hot, applied for 10 minutes can help to relax the muscles around the back*. What happens if I have pain into my leg, often referred to as Sciatica? I would always advise that you seek advice from a health professional such as a Physiotherapist or your GP if you are experiencing pain into your leg. Especially if there is any weakness in the muscles, pins and needles, numbness or the pain goes into both legs. They will be able to assess what is causing the pain and give you more specialist advice. Even with leg symptoms we encourage people to keep as mobile as possible, moving as pain allows and not rest in bed. Local application of heat or cold may help to reduce pain. * If you are uncomfortable at night placing a pillow long ways between the knees when lying on your side can help keep the spine in a good position and make you more comfortable. Back pain associated with leg pain can take a little longer to settle down and may last for 4-6 weeks. If your symptoms worsen, are not settling or the pain goes into both legs, seek advice. Take a deep breath in and allow your ribs to relax into the mat as you breathe out. Take a breath in to prepare and as you breathe out slowly allow your back to gently roll into the mat and feel your tailbone curl upwards. As you breathe in gently return to your starting position. If you have your hand on your tummy you will feel it slightly dip in. Rock slowly within your limits of pain. Repeat 6-8 times and then come to rest so your spine is lengthened along the mat. Ready for the next exercise. Hip Twist This exercise is good for getting the spine moving and opening up the small joints at the side of the spine. Allow your arms to move now slightly out to the side and make sure that you are comfortable. Bring your knees and feet together and keep your spine lengthened along the mat. Imagine your legs are now glued and as they move, they move as one. Take a breath in to prepare, as you gently breathe out start to roll your knees over to one side. Think about the knees leading the movement then allowing your pelvis to follow, continue as you feel a comfortable stretch but do not push into pain. Keep your shoulder blades and upper back on the mat. Breathe in to hold and breathe out to return to the starting position. Even if the movement is small don’t worry, work to your own limits. Repeat to the opposite side, alternating 6-8 times. Pelvic Tilting Start lying on your back with your head supported by a small towel or cushion. Allow your arms to relax by your side or place one hand on your lower tummy. Watch points: Watch that your shoulders don’t tense towards your ears and as you return to the start position don’t allow your lower back to dip in and your stomach to drop towards the mat. The best way to prevent recurrence is to keep fit and keep moving. Pilates can be a great way to maintain and increase movement in the spine as well as strengthening the muscles. One of the most important things is to choose a form of exercise that you enjoy. After all, if you don’t enjoy it, you won’t stick at it! This article should not be taken as any form of diagnosis or a substitute for medical advice. These exercises are designed to gently mobilise the spine and should not increase your pain. However, some discomfort when starting to exercise is normal. If you are in any doubt or your symptoms change, seek advice from a Health Professional. *Care: When applying heat or cold place a towel on your back to protect the skin and test the temperature on the unaffected area. Here are some gentle exercises that are designed to keep the back moving and can be performed daily within your limits of pain. Take a breath in to prepare and as you breathe out start to tuck your tailbone underneath you, allowing your back to round and your stomach to arch away from the mat. Cat Stretch This is a good way to mobilise the whole of the spine but is NOT suitable for people with Osteoporosis. Start on your hands and knees, with your hands on the mat aligned under your shoulders and knees aligned under your hips. Try to maintain a level spine. Interesting facts 1. A very common injury with a bent finger tip is a mallet finger- early treatment with a splint yields very good results. 2. Trigger finger is common and can be treated successfully in 60% with an injection and 99% with minor surgery. 3. A common cause of a painless bent finger is Dupuytren’s disease. Kandolhu; a small lush island, a sanctuary of tranquillity and beauty, ringed by an intricate, pristine coral garden, renowned amongst snorkelers and divers as one of the best in the Maldives. Intimate and tiny, encircled with white sand and surrounded by pure turquoise ocean, this haven of peacefulness is located in the heart of the Maldives, in North Ari Atoll, just a 20 minute seaplane flight from the airport, and feels a world away. Though designed to 5 star levels, the resort puts a great focus on giving its guests an ‘island experience’ instead of a typical hotel stay. Petite and perfectly formed, this island offers a real Maldivian experience with no restrictions, where guests are enveloped in luxury. The island also offers guests a beach bar with panoramic views of the lagoon and the azure sea beyond, a water sports centre which includes diving and non-motorised sports (most on a complimentary basis), a gym and an array of excursion options, from snorkelling safaris to big game fishing. The island features just thirty luxury villas across five different categories on land and over water, each distinct in design, many housing private pools. Villas are scattered around the island, on the beach with sea views or set over the water with direct access down to the sparkling ocean below. Each villa offers Maldivian architecture and distinctive natural elements, combined with modern interiors, and contemporary designer furnishings. Modern-day luxuries enhance the experience further with creature comforts like a king-size bed, guest i-Pad, Go Pro, Wi-Fi, Bose surround sound system and an espresso machine. The flooring, by Parador comes from certified, sustainably managed forests. While outdoor pieces from Rausch Classics invite guests to relax in the alfresco areas of the villas, enjoying stunning panoramic views and complete privacy. Varu Spa at Kandolhu affords guests an expansive wellness experience with 4 treatment rooms complete with beautiful wet areas set in private gardens. The spa menu, with a heavy focus on Voya products, brings guests “organic beauty from the sea” – the perfect partnership to our own nature-based approach to the art of relaxation. Choose from a wide range of treatments including massages, body wraps, natural scrubs and much more. Kandolhu offers superb gastronomy from a range of cuisines housed across four gourmet restaurants. Guests can choose from The Market, serving a selection of à la carte international favourites, Olive which boasts sweeping ocean views complemented by Italian and Mediterranean dishes. The Sea Grill opens as the sun sets over the island and invites diners to savour fresh seafood, sizzling cuts and experience the unique taste of the tandoor, while for a flavour of the Far East, guests can dine at Banzai and indulge in vibrant sushi and fresh specialties cooked with flair on the teppan, under the starlit sky. For a lazy day, in-villa dining offers a menu featuring international and local specialties, to be enjoyed in your own private haven. For pure romance, a Beach Dinner allows guests to feel the sand beneath their toes, while enjoying a bespoke gourmet meal, designed with the assistance of our head chef. Kandolhu offers three meal plans, to suit every need; Bed & Breakfast includes a sumptuous buffet breakfast either in The Market or in-villa, A La Carte Dining includes breakfast, lunch and dinner at any one of our exquisite restaurants. For complete indulgence guests can opt for the Ultimate All-Inclusive, which adds to the extravagance of dining at any of the restaurants, by including a wide range of drinks ranging from, beers, cocktails and fresh juices to a fantastic selection of bottled wines. Also incorporated with the Ultimate All-Inclusive plan is a well stocked in-villa wine cellar with 26 handpicked, globally accredited wines, as well as the option of a private snorkelling tour, or sunset cruise with champagne and canapés. Guests can walk around the island barefoot in just minutes and snorkel one of the best house reefs in the Maldives; rich in both coral and fish life, and just a stone’s throw from the beach. General Manager Abdul Latheef describes Kandolhu as, “...something very unique for the Maldives, where islands of this size are very rare. We offer guest the chance to experience a Maldives that is not typically seen. Kandolhu is the perfect combination of ‘small island Maldives’ and complete indulgence. It is an island that will make you feel like Robinson Crusoe, but with numerous luxuries at your disposal. Find quietude and peace, and enjoy absolute serenity with your loved one.” Find yourself at Kandolhu Maldives. Maldives best kept secret. Channing Tatum Channing Tatum was born on April 26, 1980 in Cullman, Alabama. He's of Native American, Irish, and French descent. Channing struggled with dyslexia as a child. His mom was an airline employee and his father worked in construction. Channing spent his childhood living in Mississippi right off of the Bayou and he once had to catch an alligator because it was getting "too big." He was sent to a military school in ninth grade, where he joined the football team and intended to get a scholarship to play after graduation. Received a full athletic football scholarship at Glenville State College in West Virginia, but he dropped out of college. Before hitting it big, held a variety of odd jobs including bricklayer, broker and a department store clerk. During his time in school, he played football, soccer, track and baseball. When he was a child, his grandparents raised him during the summers. Till today, he still goes with his family to visit them. Before becoming an actor, he was a model for major brands Abercrombie & Fitch, Emporio Armani and Dolce & Gabbana. His favourite song to perform on stage to was Ushers "You Make Me Wanna." One of his favourite movies is The Goonies (1985) and he loves the movie so much, he can recite the whole movie. Do your research Although you can now take your dog to many countries with ease it is still important to check out the country you’re visiting as rules and requirements can vary from place to place. Don’t leave it until the last minute to pick your destination, do your research within plenty of time and consult your vet to make sure you and your pooch have everything required to safely enter the country. It’s also important to research your accommodation to make sure they will accept dogs, whether it be a hotel, apartment or caravan. Plan ahead Planning your transport is another must, check the company you are travelling with will accept pets for travel and how many, if you are planning to take more than one. Some companies may also require proof that your canine companion is fit and healthy for travel, either in the form of a letter from your vet or their pet passport. Pet passports A passport for your pooch is one of the most important things you will need to organise before your trip. To go in and out of the UK you will need an EU Pet Passport, this needs to be sourced from a government-authorised vet known as a Local Veterinary Inspector (LVI). Sections I-V of the passport needs to be filled in by your vet detailing your pet’s vaccination records and evidence of their microchip. Microchip For identification purposes your dog must be microchipped before your holiday, this is also now a legal requirement in the UK, this can be done by your vet. This must be done before they get a rabies vaccination, and you will need to record this microchip number in your pet passport. Vaccinations You must ensure your four legged friend has a rabies vaccination before any travel, along with a tapeworm treatment before coming back into the UK. Tick treatments also need to be up to date, as they can pass on dangerous diseases to your dog and this risk can be much higher when travelling. Depending on where you are travelling to you may also want to research mosquito and fly protection for your pooch. It’s important to consult your vet before any travel, to make sure your dog is fully protected, as different countries will have different requirements. Get an authorised pet travel carrier Once everything is sorted and you are ready to begin your big adventure there are a few things to remember whilst you are travelling. Make sure you have an authorised pet travel carrier so your pet is safe and secure during your journey. If you are travelling by car your pet will either need to be in a crate or have a car harness or dog seat belt attached. Watch the temperature Keep an eye on the temperature; never leave your dog your dog in a hot car. When you reach your destination country it may be much warmer than your dog is used to so remember to make sure your dog is cool enough, and take regular breaks to ensure they can have a drink and go to the toilet. Keep calm and carry on If your dog is prone to sickness or anxiety during travel you can speak to your vet before you go who can advise on the best treatments to combat this. You can prepare your dog for a trip by taking a calming supplement such as YuCALM, by Lintbells, at least three weeks in advance. This can help your pooch to become a happier and calmer traveller. A fast acting digestive supplement such as YuDIGEST PLUS can also be a benefit to your pooch, as it can support any digestive upsets that may be caused by the stress of a new environment and/or different foods. But most importantly enjoy your trip. For more information about Lintbells please visit www.lintbells.co.uk 01462 416866. Are you a fan of French inspired interiors? Or would you like to bring a spot of rustic styling to your home with a hint of chic? If the answer is yes, then take na look at our top interior picks for a Frenchadapted country abode. motion sensing and smart tracking cameras, even the ability to link up to a 24hr monitoring centre who will be alerted by any unexpected visitors. No matter how many cameras are on a property they will not stop intruders, but should the unfortunate happen then the footage could be vital in assisting the police in their investigations. For more information on protecting your home or business please don’t hesitate to contact us and arrange a free consultation. Jon Knight is a director at Connected with over 20 years in the Audio Visual and Smart Home industry and are members of Custom Electronic Design & Installation Association (CEDIA). If you are looking to incorporate multiple devices into your home or perhaps your existing amount of tech has got out of hand and requires a little stream lining, you may consider services such as ours. You may even be building or renovating; if so it’s the ideal time to speak to us, your local Technology Integrator about the installation of the correct Smart Home infrastructure to ensure a “Future Ready” home. We also have a dedicated ‘Land & New Homes’ department, with extensive experience in dealing with the sale of building land and new build properties for sites of all sizes. For free, no obligation advice please call either of our offices where our friendly staff will be more than happy to help. ÂŁ795,000 This substantial detached family home is set in a large secluded plot in an established residential area within walking distance of the popular Lickey End First school and local general convenience store. The property is also convenient for commuting to Birmingham, the national motorway network and the facilities of Bromsgrove. The well appointed house offers spacious accommodation of approximately 3,200sqft comprising: A welcoming reception hall; large lounge; family room; large double glazed conservatory; dining room; fitted breakfast kitchen; side hall; utility room; cloakroom; indoor swimming pool with bar area; gallery landing; five double bedrooms; a large en-suite bathroom; and a family bathroom. In addition, the property benefits from a very large attached garage (currently partitioned to provide an office), gated driveway and courtyard providing secure off-road parking for several vehicles, gas-fired central heating, double glazing, private landscaped gardens to side and rear and a further garden plot to the side of the landscaped gardens. requirements. Based upon our activities during August, September is likely to be another busy month. The merits and dangers of “one off viewings” Some agents are increasingly resorting to “one off viewings” as a means of enticing would be sellers onto the market. Whilst such an approach does have some merit (focussing in on motivated and capable buyers with minimum disruption), unless such viewings produce a premium priced offer there is one glaring danger in this approach:FAILING TO EXPOSE THE PROPERTY TO THE WIDEST POSSIBLE MARKET OR AUDIENCE RISKS FAILING TO REALISE THE MAXIMUM VALUE. “If there’s a granny annexe, for example, which hasn’t been declared correctly on the documentation because it was built recently, we wouldn’t necessarily know. Other grey areas include shops with flats above, or student accommodation.” An expert cited the example of a wealthy client who bought a property in August 2014 for £4.25 million, and was advised that it was classified as being a 'residential' property and consequently paid £297,000 in stamp duty. However, in July this year a specialist spotted that he should have paid a “mixed-use” rate because the property came with commercial land. The result was he was refunded £127,500 by HMRC. We have an associate business that can assess any transactions up to 4 years past to ensure the correct rate has been paid with no upfront cost on any building costing more than £500,000. www.wisemoveestateagents.co.uk Here at Wise Move we always go the extra mile so we have put a tailored package together just for you plus you will save hundreds of £££s at the same time. Full internet coverage including Rightmove and Zoopla Accompanied viewings 7 days a week 365 days a year Viewings available from 9am to 9pm No sale no fee No long contract tie in Feedback after every viewing Genuine buyers waiting High quality photographs Eye catching For Sale boards Full after sales service to get your property to completion with ease And to save you hundreds of £££s we will reduce our fee by 25% and if it’s not sold within 2 weeks we will reduce it by another 10% so give us a call on 0121-453-4344 and speak to a member of the team or you can pop into our Rubery branch for a chat. VW Passat GTE The GTE badge was first ushered in with the VW Golf and it eventually made its way to the more conservative Passat. Bolting a plug-in petrol-electric propulsion unit to a model that is best known for its diesel pulling power was perhaps a brave move for Volkswagen. But it seems to have paid off with the Passat. Like the Golf, the VW Passat GTE’s looks are characterised by C-shaped LED lights accommodated in its bumper, and the blue bar that stretches across the headlights and grille. It’s a restrained fine-tuning of the Passat’s tailoring, although, given the intense hue of blue, the use of which even expands to the car’s brake callipers, the GTE model is simple enough to distinguish from diesel Passats. The battery capacity and output have been given a bit of a boost, but the petrol-electric set-up is fundamentally the same as in the VW Golf GTE’s. The 156PS 1.4 TSI petrol unit and 115PS electric motor combine to make 218PS, giving a 0-62mph sprint of 7.4 seconds. Top speed is 140mph, but unless you’re on a German autobahn, you’re unlikely to risk finding out what that feels like. Step into the cabin and the Passat GTE houses a few understated touches, such as blue piping, blue stitching, aluminium trim and GTE emblems. Other than that, the switchgear and seats are the same as in any other Passat. And, as with all Passat saloons, space is generous. Even with the car’s lithium ion drive battery beneath the rear seats, the VW has good room and a boot that is big enough for a family’s needs. The Volkswagen’s electric charging time is easy to cope with. Plugging the car’s sevenpin charge cable into a 16A wall socket, I got the 9.9kWh battery from a quarter charged to 100 per cent in under two hours. The GTE runs well on electric-only juice, with a possible range of 31 miles on zero emissions. In Hybrid form the VW saloon responds admirably, even when the petrol engine has closed, which it’ll do at moderate motorway speeds. The power unit restarts effortlessly when it needs to, while the car’s cruise control allows it to store its own impetus and cruise economically. The Passat GTE’s handling is as good as its performance. You can thrust the saloon through bends and its tyres will dig into the tarmac strongly. There’s very little body roll, and the steering, while not delivering that much feedback, is precise. Here’s the important bit, though. VW claims the Passat GTE will do 156.9mpg on the combined cycle. But, as with all cars, this model’s economy will depend on what your driving is like. On a 60-mile run, beginning with a fully charged battery and driving on a mix of roads, I achieved 80.1mpg. Volkswagen’s Passat GTE is, without doubt, a talented car and an attractive vehicle in a wider sense than a conventional highperforming, fully loaded volume-marque. By blending large car pragmatism with a sophisticated plug-in hybrid system, VW has produced one of the greatest reasons yet to think about swapping from a standard oilburning business saloon to an electrically powered one. Following Usain Bolt's final individual race during the 2017 World Championships in London, we look at what his lasting legacy for the sport of athletics will be. On one of very few disappointing evenings for the Jamaican superstars, Bolt was upstaged by controversial Justin Gatlin during the recent World Championships in London. In fact, he was only able to scrape third in his penultimate race. This loss will sit alongside his disqualification in the 2011 Daegu World Championships, rather than his world best times in 2008 and 2009. That night in Berlin's Olympic stadium in 2009 will forever be the night that Bolt established himself as the top athlete not only in athletics, but in world sport. Not only did he storm to victory in the final of the 100m but he did it will aplomb, beating his own world record he set the year before in Beijing. That 9.58 time looks very unlikely to be beaten anytime soon. Gatlin, the winner of the race- was greeted by a chorus of boos when crossing the line- the man who has failed two drugs tests was hugely unpopular when he came back from his second drugs ban, many fans even believe that he should never been able to return. The fact that Bolt lost to a past drugs cheat on his big night will no doubt not sit well with him, especially after all his hard work in cleaning up his sport. Lightning Bolt's legacy was no doubt still intact however- his eight Olympic golds and 11 World golds looks unsurpassable in modern athletics. The sport will undoubtedly suffer from his absence. His character made it fun and enjoyable and pretty trendy to watch athletics again. There are in fact, very few athletes who can draw a crowd as well as Bolt- the whole stadium audience, as well as all the viewers around the world would all be in the palm of his hand- pre and post race. As was evidently clear following his loss in London, his sportsmanship is something all younger athletes will have learnt off him. To congratulate Gatlin with such grace and professionalism is a true reminder of how special the Jamaican is. In clips before and after races it's also evidentially clear that Bolt doesn't act like a superstar and is pretty happy to help the young and up-and-coming sprinters in the practice areas. Bolt will always be remembered as the main man who transformed athletics from a dying sport to one which was a singular, smiling superstar. Following the 2008 Beijing Olympics, he was the shining light that guided athletics away from the darkness. The previous six years leading up to the games, three gold medals were returned by Marion Jones and Gatlin also had a record stripped following failed drug tests. Speaking about long term rival Tyson Gay's drugs ban, Bolt stated: "it really bothered me- really, really bothered me." The treble world record holder will leave an enormous gap in athletics, one which will be near impossible to fill. But, sport never stays still and the new era will have to start, the question is, who could possibly replace the greatest? Absolutely amazing party for our 7 year old son. Mark and Tina were fantastic with the children they explained everything to make it safe whilst keeping it fun at all times. The boys (and competitive fathers!) loved every minute of the woodland laser tag. Then a picnic in the open fronted barn – perfect. Thank you so much for a great day. Amazing!!!! After wanting to do something to mark mom’s birthday that was different & something she’d wanted to do for a while, Clay pigeon Shooting it was. Mark was amazing, patient and full of knowledge & Praise – yes I hit something. Would definitely recommend & will hopefully be back soon. Nearly a week on and I’m still shocked I hit something. Highly recommended for both the experience and for mark himself. Ahead of its third season release date on the 1st September, we look at how the drug cartels of Colombia have become Netflix essential viewing. The series is based on true events throughout the bloodiest period of Colombian history. Narcos follows the rise and fall of the notorious and unmistakeable Pablo Escobar- played by a brilliant Wagner Moura. It focuses on how Escobar continues to elude the DEA (Drug Enforcement Agents), CIA and Colombian police. Some scenes in the second season are particularly gruesome but they need to be to show the realism and truth of the story that the producers, José Luis Escolar and Paul Eckstein are trying to get across. Especially, during the many battles between the Medellin and Cali cartels and the Colombian police. One of the show’s main pulling points is its ability to be different to every other long running television series. The story is narrated by a DEA agent named Steve Murphy (Boyd Holbrook), who along with his partner Javier Peña (Pedro Pascal) is set with the task of bringing down Escobar and the cartel. Things continue to heat up and Escobar begins to feel the pressure of the DEA on his back. Moura does an excellent job in his portrayal of Pablo Escobar, hence his two Golden Globe nominations. In a very strange way you actually feel sympathy for a man who is a clear criminal, you feel like in terms of Narcos, that the good guy is in fact Escobar. The first season chronicles the life of Pablo Escobar from the late 70's to July 1992. It focuses on the evolution of the Medellin Cartel and how Escobar shifted his focus from dealings on the black market such as moving trucks with illegal goods to the cocaine business. The season ends with Agent Peña passing over intelligence on the Cali Cartel- planting obvious seeds for the upcoming season’s plot. If you are unaware of the history of the drug cartels in Colombia it's a fascinating watch and it will keep you guessing right to the last second of every episode. The first season ends again with Escobar escaping the law through the unlikeliest of scenarios, involving La Catedral Prison (the prison Escobar himself built.) Another strength of Narcos is how well paced it is. When it needs to be slow, it is but the majority is very fast of paced. The second season picks straight up from the ending scene from the first and within the first few seconds shows how much influence Escobar had in Colombia. This season focuses on how Pablo manages to remain untracked by the authorities and the levels to which he would go to remain out of the firing line. The second season also beings to plant the seeds for what could possibly happen in the third season with the Cali Cartel beginning to raise their profile and the cracks beginning to show in Escobar's armour with members of his organisation switching sides. Season three will again follow straight on from the end of season two and will show how the actions of the DEA will have consequences and how the end of one empire isn't necessarily the end of the war as the Cali Cartel are very much still alive. There are so many Colombian drug cartel documentaries and television shows on Netflix at the moment but Narcos easily ranks as number one. In fact it's head and shoulders ahead of any of the competition. two shots on -5, ahead of 2014 British Par 3 champion Eddie Pepperell and qualifier Mason on -3. There was a four-way tie for 4th place, with MacLaren turning in the best performance by a female player in the Championship’s history, alongside the country’s greatest amateur player, Gary Wolstenholme MBE, European Senior Tour star Andre Bossert and European Tour player Steven Tiley, with all finishing on -2. O’Hanlon said: “I feel unbelievable! It was a rollercoaster and my emotions are still all over the place, to go from second last year to my second win now, I’m delighted. “I’m a club and teaching pro, and this is European Tour money, this is out of this world!” O’Hanlon thanked all involved, including title sponsors Farmfoods’ CEO Eric Herd who O’Hanlon described as “having changed his life”. The Super Senior category was shared by Ian Woosnam and four-time Super Senior winner Carl Mason, with a score of +1. The Norma C Herd Silver Salver prize, awarded to the best ranking amateur, went to Michael Lawrie, son of 1999 Open winner Paul Lawrie OBE, with a score of +5. While the Team prize went to O’Hanlon and his amateur partner Tony Lymn, with a combined score of -13. An emotional O’Hanlon received the trophy in-front of a packed grandstand, with a capacity crowd showing their appreciation towards the worthy winner, as well as the winners of the other categories. The final day of the 2017 Farmfoods British Par 3 Championship saw the celeb stars hit the Cromwell Course, concluding with former Liverpool and England striker Robbie Fowler winning the final Celeb-Am. He claimed victory with a score of +3, clinching the title with a fantastic round which saw him hit three birdies. Former 1992 F1 champion Nigel Mansell CBE, BBC news and sports host Dan Walker, Strictly Come Dancing star James Jordan, and Coronation Street star William Roache MBE all took to the Cromwell Course too on a glorious day of sunshine. The fun of the Grand Finale Ball took place later on Friday night, with Olympic hero Derek Redmond hosting proceedings. Prize giving ceremonies took place, alongside a three-course dinner and quality entertainment. Highlights of the 2017 Championship will be shown on on Sky Sports Golf during September. Next year's Farmfoods British Par 3 Championship will take place from Tuesday 7th- Friday 10th August 2018 at Nailcote Hall. If you are interested in playing or sponsoring next year’s event, please visit: www.britishpar3.com for more information, and to apply for free spectator tickets. The Farmfoods British Par 3 Championship would like to thank title sponsor Farmfoods and event partners Nailcote Hall, Champions (UK) plc, Browns Food Group, The Eagle Tour, ITV, The Birmingham Post, Total Motion, Glenmuir, Bentley Leicester, Inspirational Magazine, Finest Catch, Champions Celebrity, VPAR Live Golf, Liberty, Golf Punk and Champions After Dinner Speakers and chosen charity for the event Rainbows Hospice for Children and Young People. Returning media partner, Sky Sports have also supported the event with its usual excellent coverage. Weekly Quiz at the Crown Inn. Monthly Tea Dance. at Parkside Hall, Parkside, Market Street, Bromsgrove B61 8DA. Dancing to Brian’s Super Sounds. Admission £4 (includes coffee, tea and biscuits),everyone welcome ! The event is monthly and will continue to run throughout the year on the last Tuesday of the month. DISTRIBUTORS WANTED Would you like to help deliver our magazines? Must be reliable, Must have own transport, free to deliver the first week of the month. Contact Richard on: 0121 796 6800 for more info.